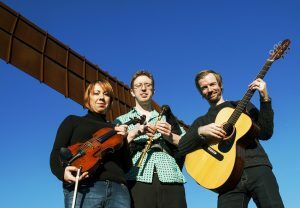 Three award-winning musicians from Newcastle – Northumbrian piper Andy May (Jez Lowe and The Bad Pennies, Baltic Crossing), guitarist Ian Stephenson(Kan, Baltic Crossing) and fiddler Sophy Ball (422, Bottle Bank Band) – come together as the Andy May Trio to play high energy instrumental folk, inspired by the music of their native North East. All three members are also experienced teachers and workshop leaders. Andy and Ian both teach on the folk music degree course at Newcastle University, Sophy is a professional folk music teacher throughout Northumberland, and Ian was Director of this year’s Folkworks Summer School in Durham.